As an avid cook who isn’t afraid, thrives on is more like it, experimenting in the kitchen– my pantry is sometimes home to what others might consider ‘odd’ ingredients. Things like tomato powder, white pepper, matcha powder, boba pearls, even rose water to name a few. Ahh, rose water. It can do beautiful things to certain dishes, by my friends a little bit goes a looooong way. I try to warn the sons about things like this, but they just think I’m holding out on them. Keeping all the yummies just beyond their reach. I knew exactly what would happen. I warned them anyway, just because I’m nice like that. Don’t drink the rose water. As usual they waited, not wanting to be the one to break the seal and get in trouble for it. Sneaky little buggers, or at least they think they are. I used what I needed and then left it sitting on the counter. 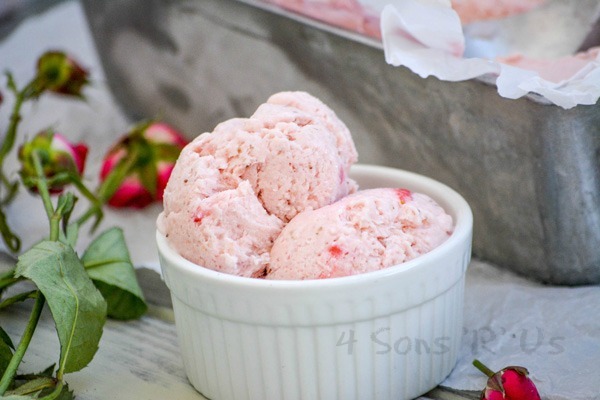 I put my gorgeous batch of creamy Strawberry Rose Ice Cream in the freezer to chill, and then I sat down to play on my computer while I waited. I didn’t even need to see them to know what was happening. I heard Sons 2 & 3 whispering. I knew they noticed I’d finally used it and were debating who would take the first sip. Five seconds later came the retching and gagging. See the thing about rose water is that a tiny bit gives a recipe amazing complex, yet subtle floral hints. Any large amount, even an undiluted sip tastes like you’ve just drunk your grandmother’s perfume. And it won’t go away no matter how much water you chug, at least not for a good long while. So if you decide to test those waters for yourself be prepared to bowl over anyone you talk to with old lady breath. Any who, back to my kids who once again didn’t listen to their mother and suffered the natural consequences of such. This though, was funny as hell. Son # 2, the winner of the taste-testing toss up was not amused when I couldn’t stop laughing. It probably wouldn’t have been nearly as funny if he hadn’t been having a fit trying to get rid of his flowery death breath because his girlfriend was due any minute. I did try to warn him. Oddly enough, his brother wasn’t so eager to try it after that. 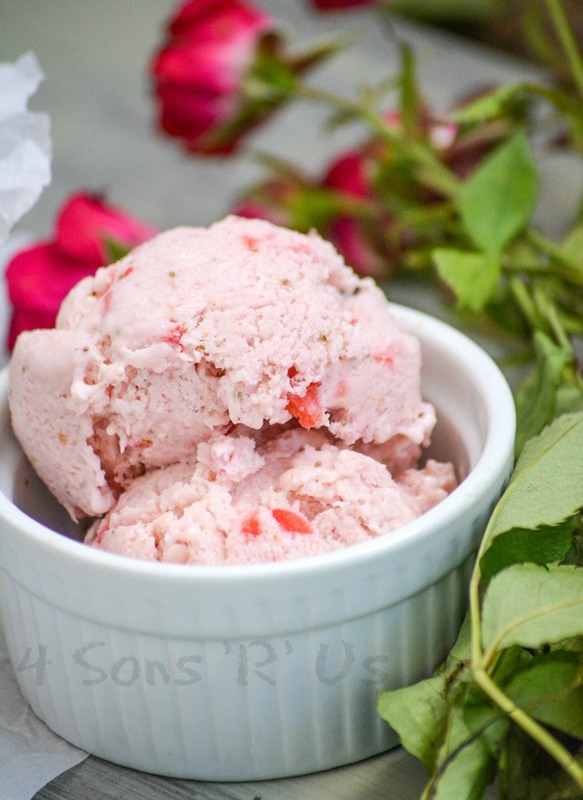 Getting back to the original point of my post, Strawberry Rose Ice Cream. If there were two things my mother loved when I was growing up, it was her freshly cut roses from her carefully groomed bushes and fresh strawberries hand picked out of the local patch in Spring. What can I say? My mom has pretty good taste. And while I can honestly say that once upon a time, I never would have thought of combining the two in any dish– they pair together perfectly in this ice cream. 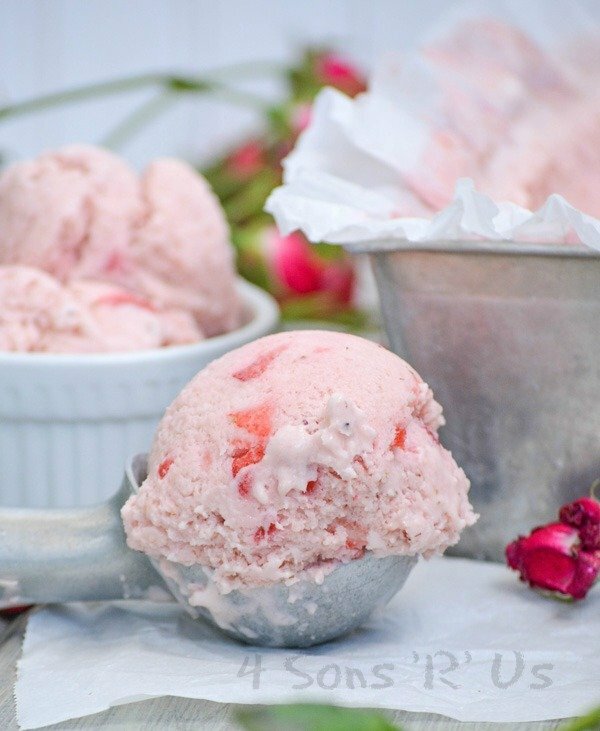 Creamy pink, no churn soft serve is studded with tiny chunks of fresh berries and infused with just a hint of floral essence that compliments without overshadowing. 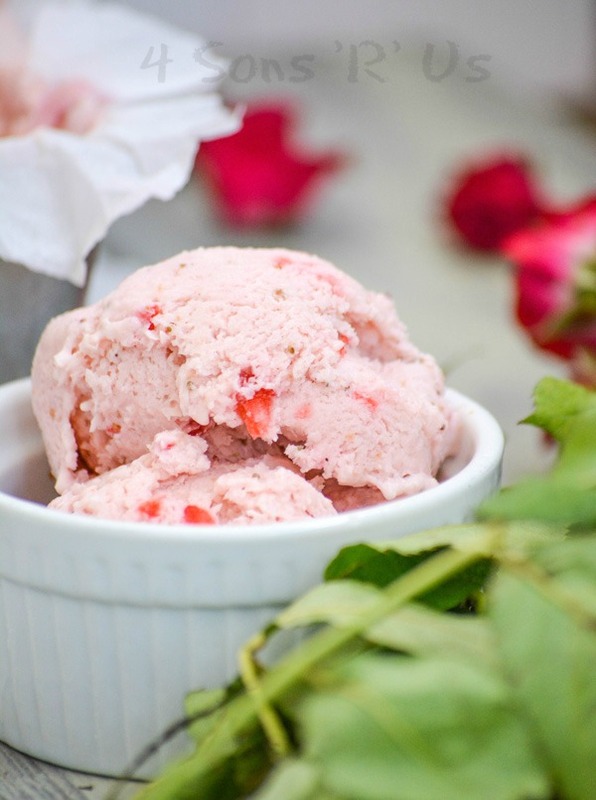 A little bit fancy, but easy enough even for a last minute occasion our Strawberry Rose Ice Cream is a perfect treat for Mother’s Day, or any day you want to show your Mom how much you care. 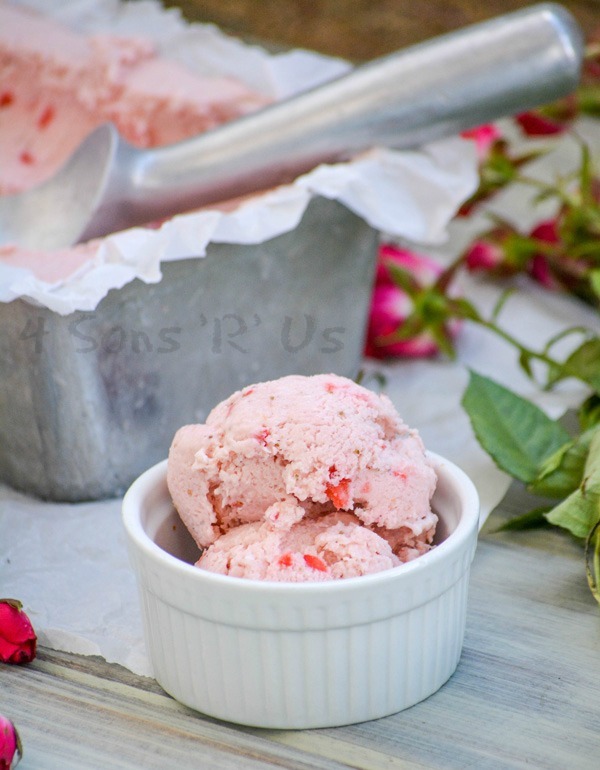 A simple no churn ice cream featuring an elegant combination of strawberry flavor with a hint of rose. In a blender puree the strawberries, except the few set aside. Add in the milk, rose water, and extract. Blend again just until evenly combined. In the bowl of a stand mixer, whip the cream, just until stiff peaks form. Don't over whip or it will separate into butter. 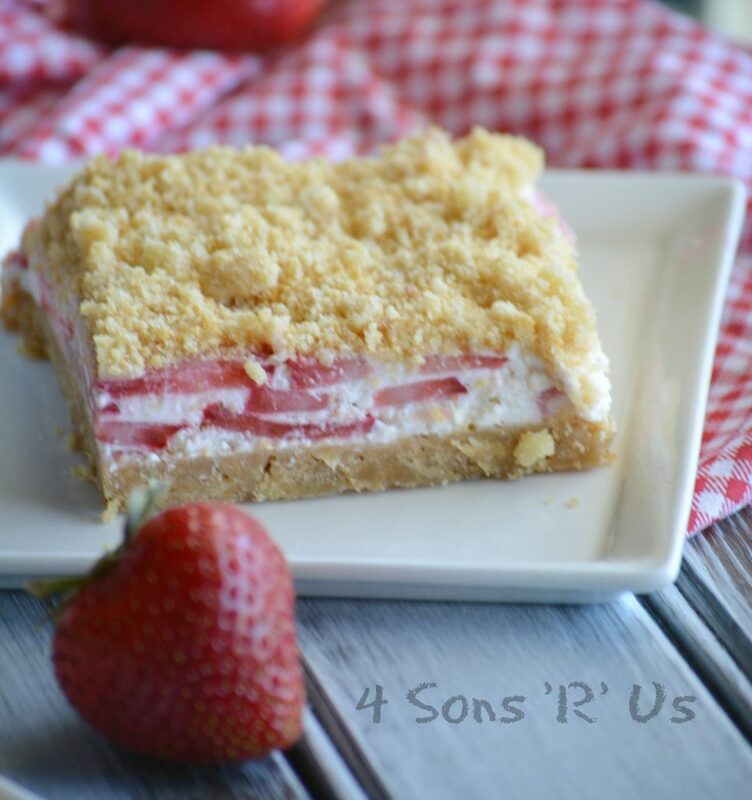 Fold the strawberry mixture into the whipped cream until evenly combined. If you want a deeper pink, stir in the food coloring. Line a 9x5" metal loaf pan with parchment paper. Pour the ice cream mixture into it and use a spatula to gently smooth out the surface. 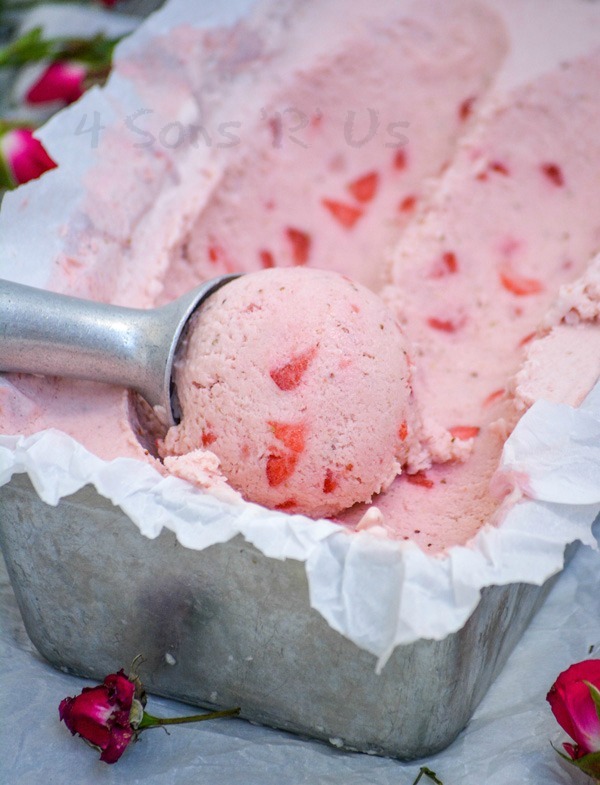 Put the ice cream in the freezer, and let it freeze until frozen solid-- or up to overnight. 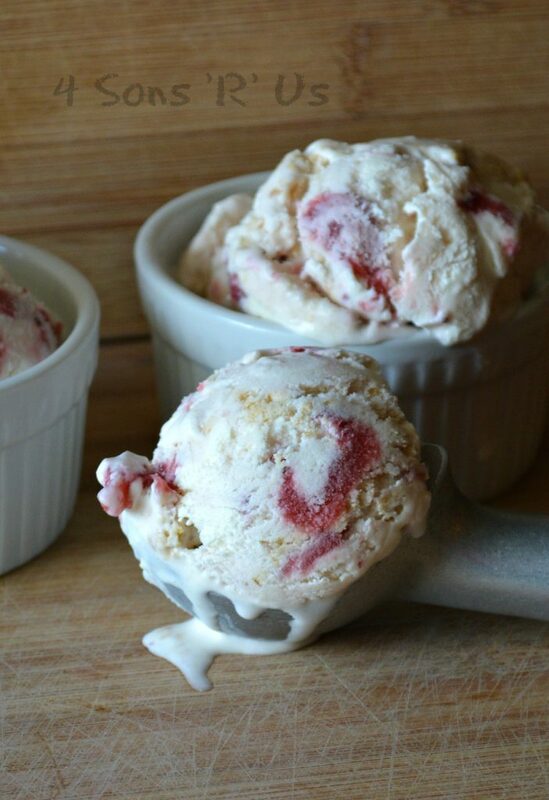 Allow the ice cream to soften for five minutes before scooping and serving.